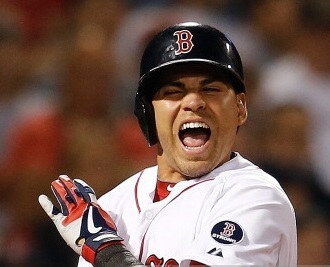 Red Sox center fielder Jacoby Ellsbury left Wednesday night's 4-3 win over the Orioles with an apparent foot injury. In the seventh inning, Ellsbury hit a pitch off his right foot, which left him hurting and the Sox's medical staff running. Ellsbury continued the at-bat, hit an infield single and was checked on again at first base by the trainers. Ellsbury could not have been hurting that bad as he stayed in the game, promptly stole second and scored the game-tying run. Ellsbury did leave the game in the top of the eight inning and Shane Victorino slid over to center. Ellsbury, the soon-to-be free agent, is hitting .298 with 29 doubles, eight triples, seven homers, 83 runs scored and 49 stolen bases in 53 attempts this season.